"At the Frontier of Different Universes"
Lin Yan, who was born in 1961, belongs to a generation of artists that received a strict education in drawing and classical western realist painting. Besides technique, she learned the perseverance necessary to attain the level of perfection expected by her teachers at the prestigious Central Academy of Fine Arts (CAFA) in Beijing. She was educated in an atmosphere of intense competition. Progress on the work itself was the rule. It was the requirement to be noticed, to be considered the best. The system gave very little individual freedom to the average student. But Lin Yan did not come from an “average” environment. Her parents and maternal grandparents had already established themselves as respected painters in China. They provided her with the necessary link to connect her education to a cosmopolitan world and to endow her a sense of exploration and experimentation. Her maternal grandfather, Pang Xunqin (Hiunkin Pang), was trained in Paris from 1925 to 1930, and her grandmother, Qui Ti (Schudy), studied oil painting in China and Japan in 1928. They brought the colors and techniques of Post-Impressionism and Fauvism back to China. Pang Xunqin created the Storm Society, an avant-garde group in Shanghai. Qiu Ti was one of China’s first female oil painters. Pang Tao, Lin Yan’s mother, was a visiting artist at CAFA’s studio in Paris and did research at the Ecole des Beaux-Arts for a year, where she became the first Chinese professor to depart from realism. Lin Yan’s father, Lin Gang, studied western art in the Soviet Union. The family’s involvement in modern art made it a target for radical political movements in China. The fact that Lin Yan’s grandfather had established China’s first school of modern art and design resulted in his being labeled a “Rightist” for more than twenty years. Lin Yan’s parents were sent to the “5.7 Reform Camp” during the Cultural Revolution. Lin Yan was left behind in Beijing, with a succession of different families. 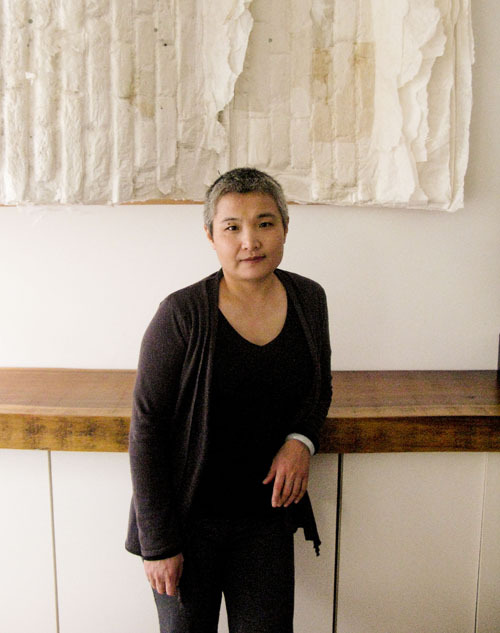 When she started her college education at CAFA in 1981, Lin Yan quickly drew the line between what was expected from her as a student and what she could obtain as the daughter of her rehabilitated parents who taught and lived on campus. She had access to books only available to faculty members. The privilege enabled her to look at things differently and to develop her own opinions. She was fascinated by the way Kandinsky related color and music together. It introduced her to abstraction. But she also realized that she had to be careful; she needed to give her teachers what they expected from her. At home, she kept a personal sketchbook for her abstract work. Her parents warned her that she would never find a job if she persisted in her fascination exclusively with abstract art. But she had already made her choice. The path towards abstraction would provide a central spine for her own contradictions to dialogue with each other rather than resulting in a collision. During the year spent at the Ecole des Beaux-Arts, she studied how to make and use artistic media and techniques. It was an educational springboard, which expanded her options. This established the foundation for her to explore the materials she was to use in her art over the next twenty-five years. She later discovered the multiple possibilities of paper, a medium unique in Chinese art. She also learned that she could afford to be different. She did not have to compete with other students to succeed. She no longer expressed herself by simply reproducing a model. Instead, she began to feel her work and through that to discover what was inside her. The sophistication of Paris spoke deeply to the young girl. She could relate to the city’s old buildings as well as its culture and history. Beijing and Paris have that in common. A discovery was the light of the Ile de France. It was the light painted by the Impressionists. She could finally connect it to their paintings. Her relationship with the city was romantic. When it came to contemporary art, Lin Yan found it difficult to relate the works in the Centre George Pompidou with what she saw around her. She could not see the intimate connection between the work exhibited and the culture emanating from the city. She would have to go to America to find that. Her dream had always been to go to the United States and very precisely to New York. Before going to Paris, she had pointed her finger close to New York on a map and applied to different schools. The University of Pennsylvania at Bloomsburg offered her a full scholarship. On a map, it did not look that far away. When she arrived in the United States, she took a bus, confident that it would only be a short trip to Bloomsburg. After two hours, and still not close to her destination, she said to herself “Whatever!” She was in the country that would give her the potential to find her own space. A space that connected her directly to contemporary art without compromise. Her first black series Qi is a reflection on deterioration. Qi #2 -To My Hometown is at first very disturbing, nearly violent. The work depicts the shock experienced by the artist. It is a primal scream, expressing contradictory but inevitable forces. We are a world apart from the stereotypes of what was old Beijing. But the work is not a reference to the physical aspect of the city. It is a quest. How do you go back to your roots? What fragments would you put in the suitcase called memory? For Lin Yan’s generation of artists, there was a Manichaean division of the world between the communist society they came from and the capitalism they encountered on their arrival in the United States. But that dichotomy was already disintegrating when she returned home. Beijing was suddenly under the yoke of an intransigent capitalism. The destruction of traditional environments expressed how the Celestial Empire had finally reached heaven! Lin Yan found the worst of a capitalist society. It was unexpected to someone trying to re-connect with her own society and its values. The cultural edifice was on its way towards annihilation. From that point on, Lin Yan started a voyage that brought her deep inside herself by consciously eliminating external distractions. Utopia was gone. She had seen the materialistic transformation of what made her youth. New materials, new heights, new volumes and new proportions became the new core of her society. She needed to find a point of equilibrium that would help her to resolve the tensions between her two worlds, the East and the West; between the origins of her life - her memory - and the adoption of her adult life - her history. Her work became more and more “minimalist.” It took the path of bringing stories together, a transaction by which she bridges duality, conflict and contradictions. Her palette of black and white helps her to go to the essence of abstraction. 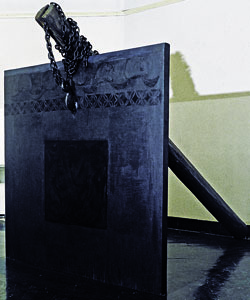 “There is nothing much to talk about” says Lin Yan in an interview given to art curator Liu Libin in 2006. A definition like a scalpel: there is no compromise. To discover the true nature of the world, one must find oneself. Lin Yan believes that, as an artist, she can take old patterns and old techniques to create something new. Black and white are the fundamental colors of classical Chinese art. White is the natural color of paper. Black is the color of ink, the vehicle that allows the transmission of ideas. Combined, paper and ink are the memory, the DNA of Chinese culture. Grey/Black is also the color of Beijing. The original houses in the “hutongs” (small alleys) were built with grayish bricks and tiles. Black was considered the “king” of colors in ancient China. It is associated with water, one of the five elements that compose nature. Black equally plays with white in the unity of Yin and Yang in the search for harmony. To reach infinite variations in her black palette, Lin Yan mixes different black oil colors with mat or gloss media to create subtle feelings. She also uses acrylic, tempera or wax. “Black is not a unique color. It has a complete palette. From Chinese paintings, I learned how far I could go with only black. For ten years, I used different blacks on different media. Since 2005, I have used only ink. I used different Chinese paper as media too.” Quite naturally, Lin Yan came to use handmade xuan paper and mulberry paper (xuan zhi and pi zhi). Each kind includes a wide variety of paper made from the bark of a type of elm tree or mulberry tree. Created during the Tang Dynasty (7th century AD), it was used largely by painters and calligraphers. Lin Yan’s choice for these papers was natural in the sense that they are common paper, and consequently intrinsic to Chinese culture. With these two extremes, black and white, she had an enormous palette of variations to play with. She could then compose much more with the effects rather than the representational forms of objects. 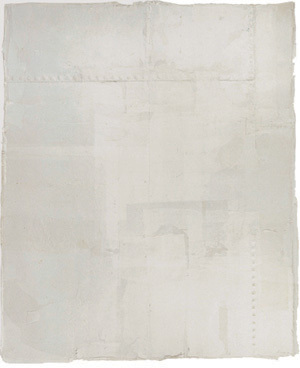 In pieces like Curtain #1 and Raining Inside II, we can find a historical richness of white and black. And because of this tradition, there is also a possibility for openness, for new superimpositions that the artist has to confront the passing of her own days with time. She is preserving her heritage in an essential way, not a representational one. If physical details appear here and there, like rivets, they serve as an invitation to memory. They are details whose significance has already changed. In ancient China, important doors, such as the gates of Beijing’s Forbidden City, were covered with golden doornails. 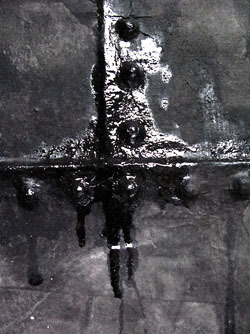 Detail of rivets in Lin Yan painting. Rivets also belong to industrial architecture. 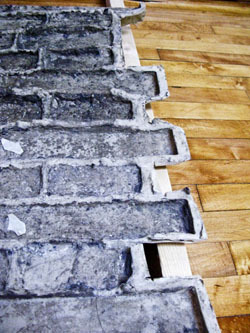 In her former studio in New York, Lin Yan had a metal floor and brick walls. What appears at a quick glance to be universal (brick walls and rivets for example) can actually express different realities. The implications are different depending on the context. “I find myself flowing between categories or borders rather than resolving the tension between representational and abstract forms or, by implication, tradition and change,” elaborates Lin Yan in an interview given to Scott Ritter in 2006. (Lin Yan, Echoes in the moment, catalogue published by China 2000 Fine Art). Architecture, painting and sculpture have an impact on her work beyond their own specificities. Lin Yan started to be interested in space during her graduate studies in America. She also understood that she could not abandon painting, more specifically the essence of painting. She did not want to reproduce objects, flowers, and humans. She knew she could do that, very well indeed. She realized that the focus was no more the painting itself. Dynamic relationships coexist between the painting, the wall and the space around. 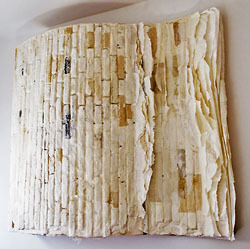 She then decided to use a material that would bring her this flexibility: the xuan paper. She needed to construct a new space in which no frame, no border would delimit her vision. “When I have a solo show,” she told us in her Brooklyn studio, “I will see the space first, and then design each work individually, to shape it for that space. So, my work evolves from a unique shape to accommodate a single wall to different shapes to accommodate a space. I like sculpture and architecture and I conceive my work within these orderliness. I start to think about a space, and this is not in two-dimensional forms. There is a three-dimensional element in my work.” The dilemma is how to integrate painting, sculpture and architecture. How do you link them? Her instinct is to re-think painting as something “simple.” Something that goes to the core of her intimacy. In Remaking, done in 2008, she offers us an immaterial diffusion that brings us to the frontier of universes where conflict and duality echo the transaction the artist has to constantly re-evaluate in order to bring her stories together. It is like the Yin and Yang: making things work together. Here the white finds a myriad of vocabularies. It is rich, dense, theatrical, and textural. For centuries, Chinese artists used paper as a flat surface. They did not bend it; they did not compose with it. Lin Yan finds her freedom by reflecting on traditional culture and by proposing a radical transformation. “Tradition could help me (to) get out of tradition, just as contemporary ideas could help me get into tradition,” she explained to Scott Ritter in the same article. The loop is closed and reconnects the infinity of our aspirations. Lin Yan uses different moulds for her work. 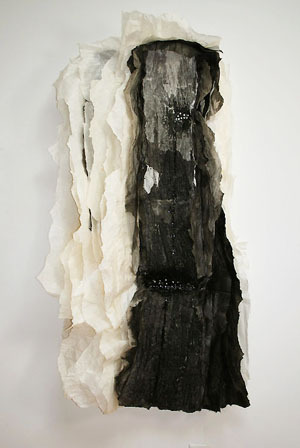 One that she took from an old brick wall in Beijing is fiberglass. She also uses a plaster or rubber mould taken from the metal floor of her former studio in New York. She has recently started to use one made from tree bark. Beijing and New York are revealed in a new interpretation that we can find in the sculptural effect that she gives to the paper. 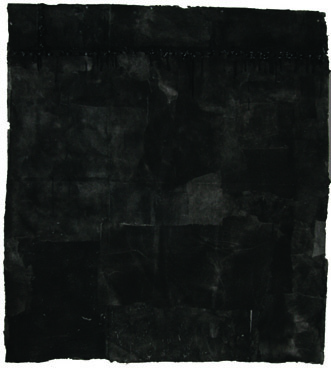 She paints her paper in different shades of black with ink and water. She carefully arranges and mounts layer after layer of xuan paper into her moulds. The layers are encrusted into the mould with the help of a traditional brush made from the fibers of a palm tree (zongshu.) The accumulation of sheets forms a flexible cast that she will shape in different arrangements. Her paper then takes a new strength, an abstract transmutation. The whole process creates an imaginary sculpture that dialogues with something that is very flat to start with: the process of a painting. Lin Yan pushes the envelope to find a kind of order within the complexity and duality of genres (painting/sculpture; abstract/non-abstract) and of visions (Yin/Yang; East/West; feminity/masculinity.) The duality does not involve rivalry, opposition or intransigence. It is an inward notion that opens a path for us. Path (2002) lets us walk along an imaginary “Fil d’Ariane” (Ariadne’s Thread), a path blazed in the silence of our individual existence stripped bare. 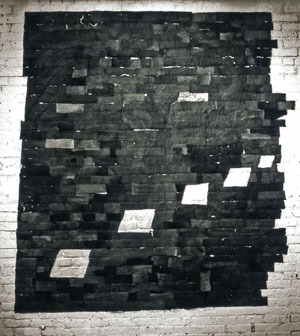 The gallery’s brick wall is covered with many brick-sized inked papers imbedded in the artist’s visual memory. Their echo is personal. The white patches, acting as stepping-stones, lead us to the fluidity of our silent voice, the voice that questions our cultural memory. They are like sediment that delicately accumulates at the bottom of an ocean, and whose mystery lightly touches us. It is the fusion of the whole, the integration that opens the path to the deepest questions about our past, our present and our future. But do not these three dimensions in time form one?